As I’ve been back in Manchester for a few weeks, I thought it was about time I headed into town for some culture. Manchester Art Gallery has opened two new fashion exhibitions over the summer, and I was eager to go and take a look. I picked up my first ever copy of Vogue in 2010, the queen of fashion magazine, Vogue, is celebrating 100 years in print. The exhibition featured a range of popular portraits to depict each decade alongside a timeline of all 100 years of vogue. From it’s mid-war starting point to the present day, you can see before your eyes the continued cycle of fashion — covers from the 60’s wouldn’t look out of place today. I loved the styles of the 1920’s, and the patterns that once came with each copy of vogue, making me itch for my sewing machine. The covers over the century also depict some of the most memorable moments from British culture – the rolling stones, Lady Diana’s wedding and death to current pop stars and icons. It’s a tribute to British culture. A timeline of our history. Beautifully photographed, designed and coordinated. Vogue is timeless, and long may it reign over British fashion. Another exhibition commemorating a centenary, Fashion & Freedom explores the drastic move in fashion within the First World War to the 1920’s. This shift, arguably, is one of the the most dramatic movements of fashion. We move from tight corsets, big skirts to shapeless dresses and even trousers in a decade. Has any other fashion movement altered women’s wear so quickly? It was intriguing to compare mid-war fashion to the work of students from across the country today, holding similarities in style but differing drastically in fabric choices, colour and expression. The exhibition once again proved the resilience of fashion, it’s impact even within the darkest days. If you’re in and around Manchester, these are two exhibition not to be missed, both free and at the centre of the city there’s no excuse for seeing a century of fashion. The Sound of Music bounced onto the Lowry’s stage in a musical extravaganza of a show for this Christmas. Filled with the classics of Do Re Me, Edelweiss and Sound of Music the music carried the show and transported the audience back to the 1930s. Beginning in the Abbey, the nuns were serious and melancholy before being slightly mischievous in How do you solve a problem like Maria. It added a sense of cheer to the rather silent abbey, a distant past to the life Maria had expected to find here. Instead she’s packed off to govern seven Von Trap children and alter the expectations of a strict and repressive father. Music is of course the answer, teaching and guiding the children with her knowledge and love. It is the love story of war, circumstances and needs, passion and short lives that bring this family together. Happy in the music and surrounding of the mountains, their perfect life becomes shattered by war. For me, the Sound of music was at times a little too cheery in its portrayal, even in the shadow of war the characters continue with their music and life without care. Even the finale of their escape is rather modest, without much suspense or determination. I would have liked to see a slight twit in the portrayal of the story, something new and raw that could have been brought to the production. Yet the audience seemed spell bound, even singing along in places, it was the tale they expected and the tale they clearly wanted to see. The Sound of Music is at The Lowry until the 2nd January 2016. For some reason I’m drawn to historic literature, to be transported back in time. To be able to reach out to characters and relate, if only slightly to events of the past. So once again, I’ve found myself back in WWII, this time following Chiara Ravello in the Nazi invasion of Rome. The tale entrapped me at once, with a small boy being passed from mother to total stranger in the hope that he would survive against all odds, as a Jew in the Nazi world. Yet, escape he manages to do, somehow his papers are not asked for and Chiara is able to take Daniele from Rome to the Italian countryside. But what happens to him? As the story darts between the past and the present we see how Chiara has been out of touch with Daniele for a decade. We struggle to see how Daniele’s life has turned out, how his mother’s choice has affected him and if he managed to truly hide from the Nazi’s all those years ago. Virginia Bailey cleverly twists multiple sides of the story together, weaving between the present and the past. 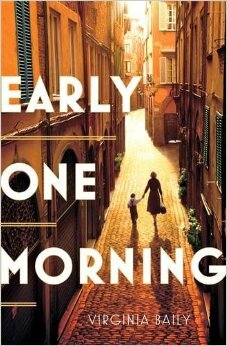 Early One Morning manages to depict the fear, heartbreak and determination of Chiara, the struggles she holds and the story she has to tell. Although I’m only half way through, I knew instantly this was a book I would struggle to put down, a book that will go far and a book I will certainly be rereading. Early One Morning will be published by Virago in July and I wholeheartedly recommend this tale of resilience in war and its aftermath.